One of the most memorable days of my life was when motion picture director and editor Robert Wise spent the afternoon with me going over the rough cut of one of my films. As Bob went through every cut with me and shared his wisdom I kept thinking to myself “My God, the man who edited Citizen Kane (1941) is helping me edit my film!” I learned so much from Bob that day, both about filmmaking and about life. One of these “Wise” lessons was his sharing with me his perceptions about a possible connection between the evolution of consciousness and the evolution of the cinema. Over his illustrious 60-year career, Bob observed that the perceptual consciousness of the cinematic audience appeared to advance along with the cinema in the ability to communicate more information, in more abstract forms, within shorter durations of time. 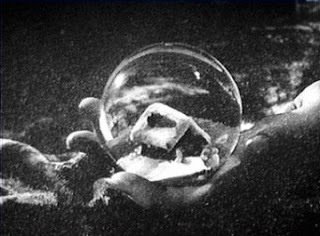 He explained that when he first started in the film industry the motion picture audiences required very clear linear story structures, and that gradually throughout his career, the audiences seemed to develop the ability to more readily and quickly project meaning across discontinuous and non-linear cinematic structures. To illustrate one aspect of this evolution, Bob used the example of a cinematic sequence that has a character driving to another character’s house for a meeting. In the old days filmmakers had to show the person driving the car, stopping the car, getting out of the car, walking up to the house, knocking on the door, and then going inside. Gradually over time, the audience has advanced to the point of being able to accept a direct cut from a person driving a car to them suddenly being inside someone’s house. Wise believed that these advancements in both cinematic expression and the perceptual consciousness of the cinematic audience were the product of an interdependent and co-evolutionary relationship between the cinema and the audience. This observation appears to concur with Jean Gebser’s (1986) contention that artistic movements and trends have a tendency to influence and be affected by the evolution of consciousness. At the end of our time together, Bob was called away quickly, but before he left the editing room, he paused to compliment my work and then sweetly and genuinely said, “I hope I helped you a little bit…” Of course, I profusely thanked him and sincerely assured him that his help was beyond measure. As Bob walked off, I thought about his last words to me and felt a mysterious shift inside me. In that brief moment, it seemed as though I had received a kind of shaktipat, or life-lesson-energetic-transmission, from this amazing man. After all the awards, honors and accolades, Bob Wise was still a sweet and deeply humble human being, and his living presence and example penetrated me in ways I still cannot describe. I will never forget that moment, and every moment I was blessed by his presence. In my heart and mind, I believe Bob Wise was a true Cinematic Bodhisattva. According to Ken Wilber's ontology, being evolves in a four-fold way. That is, each of the four quadrants co-evolves with the other three. The four quadrants are: Self (subjective being); Culture (intersubjective being); world (objective being); and systems (interobjective being). Or I-WE-IT-ITS. Or Intentional, cultural, behavioral, social. So individual and collective subjective and objective being co-evolves or tetra-evolves. No aspect of being is isolated and alone, all four aspects of being tetra-mesh, co-influences and co-evolving the other. During my studies into the application of Integral Theory to cinematic media, I attempted to look at an evolutionary or unfolding display moment in Hollywood filmmaking history through the lens of the three Integral Methodological Pluralism (IMP) principles of Nonexclusion, Unfoldment, and Enactment. The evolutionary moment in Hollywood filmmaking history I chose was the making of the first Star Wars (1977). A film that, according to most members of the various Hollywood knowledge communities, revolutionized the creative, technical, business, and critical evaluation aspects of the industry. These areas of advancement represents the four general knowledge communities within the world of Hollywood movie making, each with their own, often conflicting, paradigms/practices/injunctions and constructs of what makes a “good” movie. There is the Cinematic Artists Community, which tends to view the goodness or success of the cinematic work by how much of the artist’s subjective vision (UL) is translated onto the screen. There is the Cinematic Technicians Community, which evaluates the degree of technical/material/objective (UR) quality of the cinematic work. There is the Cinematic Business Community, which appraises the success of the cinematic work by its market reach and profitability within the economic system (LR). Finally, there is the Cinematic Analytical Community (Critics, Historians, Theorists), which evaluates the quality of the cinematic work by the contextual effectiveness of its cinematic language (LL). Conflicts often arise between these communities, and their seemingly contrary social practices/injunctions and the constructs generated by them. In the case of the first Star Wars (1977), the Cinematic Business Community (every studio) turned down the script at least once, even though many of the executives personally loved it (UL). The reasoning behind their choice was that their marketing models (LR) clearly showed that a science fiction film could not be profitable. What they failed to see was that George Lucas had crafted a cinematic vision that would ultimately transform the paradigms and constructs of all four knowledge communities (see below). Finally, one of the executives at 20th Century Fox, Alan Ladd, Jr., was able to join Lucas in ENACTING a different world by seeing the other dimensions of Lucas’ work (taking a leap of NONEXCLUSION), and by heroically putting his job on the line for the script (George Lucas, personal communication, 1978). In the end, the film shattered box office records, transformed Hollywood’s marketing models; saved Fox from bankruptcy, and gave Ladd and Lucas their own companies (LR). It created a new genre (trans-genre) within the cinematic lexicon (LL) by including many different genres (Science Fiction, Westerns, War Movies, Mythical Adventures, etc.) into a cohesive blend that transcended all of them (UNFOLDMENT). 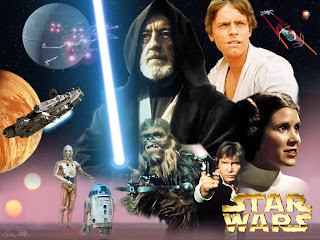 Stars Wars also helped usher in the return of mythology to American cinema and American culture (LL) by blending mythological archetypes with modern and postmodern story and thematic elements. Lucas and his technical team also managed to advance cinematic technology (UR), making it easier to translate the creative visions of cinematic artists (UL). The effect of Star Wars’ genre hybridization, techno-creative advancements, and rebirthing of mythic cinema on the cinematic audience was something the traditional business and marketing models could not prehend (LR). For additional reflections on the elements and conditions which made Star Wars such a unique and profound phenomenon, see my previous post and comments: My Cinematic Structuralism Emancipation at Integral Life.